ATLANTA, Georgia (CNN) -- A federal advisory committee issued sweeping guidelines Wednesday for a vaccination campaign against the pandemic swine flu strain, identifying more than half the U.S. population as targets for the first round of vaccinations. The advisory panel's guidelines don't trigger the start of vaccinations but are usually accepted by the government. The priority groups include pregnant women; health care and emergency services personnel; children, adolescents and young adults up to age 24; household and caregiver contacts of children younger than six months; and healthy adults with certain medical conditions. The guidelines were approved in a near-unanimous vote by the 15-member Advisory Committee on Immunization Practices. One person dissented on whether to include people ages 19 to 24 among those targeted. The vote does not trigger a decision to vaccinate against the disease, also called H1N1, but the federal government typically follows the committee's recommendations. The recommendations could prove especially important if the pandemic strain, which emerged this spring, spreads widely before sufficient quantities of vaccine can be produced to protect everyone. The recommendations are intended to ensure that members of the most vulnerable groups get priority. Earlier Wednesday, federal officials said they are on track to initiate a mass vaccination campaign by October, although many details remain to be worked out. Clinical trials to assess vaccine safety and efficacy are just getting under way at a handful of centers across the country. Dr. William Schaffner, a flu researcher at Vanderbilt University, which is running one of the clinical trials, played down safety concerns that have been raised because safety data are limited. 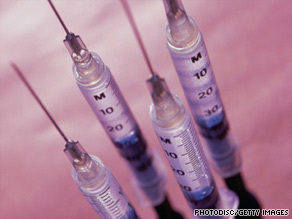 "There is no alternative" to approving the new vaccine based on the limited data, he said. Fortunately, he added, "the novel H1N1 vaccine is created exactly the same way our seasonal vaccine is created, year in and year out." Dr. Wellington Sun of the Food and Drug Administration said data from those trials would probably be available in September. However, Dr. Robin Robinson, director of the Biomedical Advanced Research and Development Authority at the Department of Health and Human Services, said that that even if federal regulators determine that the vaccine is safe and effective, it would take an additional four to six weeks before it could be packaged and available to the public. About half of Americans -- 159 million -- fall into one of the five main target groups, including 102 million people aged 6 to 18. Robinson had predicted earlier that 120 million vaccine doses would most likely be available within a month after the campaign starts. Dr. Anthony Fiore of the Centers for Disease Control and Prevention, who led the group's deliberations, said it made sense to target such a large group because it appears that vaccine supplies will be sufficient. Part of that estimate is based on experience with seasonal flu vaccine; Fiore said that, typically, only 20 percent to 50 percent of people in targeted groups seek out seasonal flu vaccine. Even if two doses of the swine flu vaccine are required to confer protection -- something that will be determined in clinical trials -- suppliers would probably be able to ramp up production quickly enough to meet demand, Fiore said. But the advisory committee approved a backup plan in case supplies are more limited. In such a case, the priority groups would be pregnant women, health care and emergency services workers with direct patient contact, household contacts of children younger than 6 months, children age 6 months to 4 years and children younger than 19 with chronic medical conditions -- a total of 42 million people. The panel also recommended that, once sufficient supplies exist to meet the needs of all targeted groups, the vaccine should be offered to healthy adults ages 25 to 64. Once those needs are met, vaccinations would be recommended for people older than 65. The targeted groups differ starkly from the recommendations for seasonal flu vaccine campaigns, which include people 65 and older in the highest-risk group. The difference is based largely on data showing vastly higher infection rates among younger people; the rate of laboratory-confirmed cases in Americans 65 and older is just 0.06 per 100,000, compared with 2.6 per 100,000 for the group with the highest infection rates, children 5 to 11. Studies have found that many older Americans carry at least some antibody protection against the new virus, probably because it is similar to flu viruses that circulated widely in the 1920s through the early 1950s. Some of the most alarming complications have been seen in pregnant women. A paper published Wednesday in the journal Lancet reported that pregnant women infected with H1N1 are more likely to be hospitalized and even die. Of the 45 H1N1 deaths reported to the CDC between April 15 and June 16, six (13 percent) were among pregnant women. Obesity has not been determined to be a risk factor, Fiore said. The H1N1 flu vaccination campaign would run concurrent with the usual seasonal flu campaign, which the committee recommended get under way as soon as possible. Vanderbilt's Schaffner said patients should get the seasonal vaccine before distribution centers are swamped with demand for the pandemic vaccine. But he also warned that the new vaccine might be of limited use. "The virus and the vaccine are in a race; the virus may win," he said. If the pandemic strain starts spreading fast between now and October, he said, hospitals and medical personnel will be pushed to the limit. "It's like thinking about a hurricane. You batten down the hatches. You do everything you can. But when the hurricane arrives, damage will occur. This one is going to be a doozy."